Google has started sending out emails this week notifying its customers that it will soon start refunding their unused Google Offers. The refunds signal a shift in how the Google Offers local deals platform works, as outlined in a July blog post. Previously, shoppers had to purchase these deals for local businesses in advance, in much the same way they do for Groupon and LivingSocial vouchers. Now, Google Offers customers can digitally clip the offers in advance without paying, save them to their Google account and then pay when they are redeemed in store by showing the offer on a mobile phone. Offers can now be found on Google Maps and Google Offers apps, as well as on the new Google Wallet app. An email from Google to an AllThingsD colleague this week gave her two options: Receive a refund for the full amount of two unused offers, or receive a Google Play credit for that amount, which never expires, plus an additional $4, which will expire in two years. 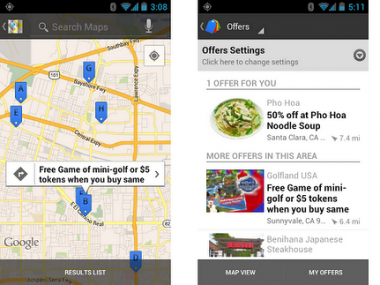 “Users can now easily discover and save Google Offers in the Maps app, Search, Wallet, and on sites around the Web, without having to purchase them in advance, so we’re refunding previously purchased offers that we believe haven’t been used,” a Google spokesperson said in an emailed statement to AllThingsD. One potential downside of this approach is that those who have downloaded offers they haven’t yet paid for may be more likely to forget about them than if they paid for a voucher in advance. Google is trying to at least partially solve that by using Google Now to notify Offers customers when they are near a store whose coupon they have saved. For businesses, the new Google Offers behave much more like digital coupons than Groupon deals, which means no money up front.